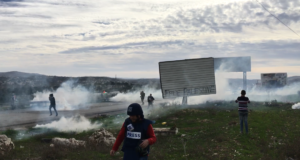 Three people were injured near Homesh settlement on Friday 21st November, when Israeli military force fired tear gas and rubber bullets into a non-violent demonstration. For the second week in a row, approximately 100 Palestinians from the villages of Burqa, Sebastiya, Beit Imreen, Talluza, Deir Sharaf and Silat adh Dhahr, as well as international activists, were stopped by more than 40 Israeli soldiers and police as they marched towards the evacuated settlement. 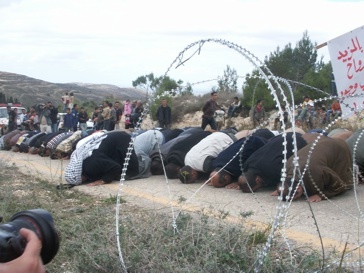 Israeli military forces had blocked the road with coils of razor wire, behind which soldiers and police lined up with weapons readied, despite the clearly non-violent nature of the demonstration. Prevented from entering their lands by the Israeli forces, the Palestinian villagers held Friday prayers by the razor wire, before they were viciously attacked with tear gas and rubber bullets in response to a single rock thrown from far back in the crowd that fell well short of the assembled Israeli military forces. Firing from a distance of just 20 metres (illegal under Israeli law which states these weapons are to be used only from a minimum distance of 40 metres), soldiers and police fired into the departing crowd, aiming at head-height, which again contravenes Israeli military laws. Three people were injured, including 19 year old Munqeth Ragheb, who, in what appears to be a deliberate targeting, was shot in his face; the back of his head; his back; and his hand with rubber bullets, as well as shot in the shoulder with a gun-fired tear-gas canister. Emad Saif, aged 48 years old; and Thaer Machmoud, 14 years, were also injured by rubber-coated steel bullets and tear-gas canisters. 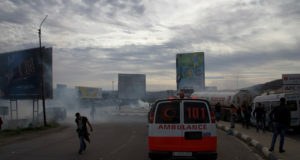 Many more were treated for gas inhalation as Israeli armed forces fired volley after volley into the crowd, with approximately 50 canisters fired in total. 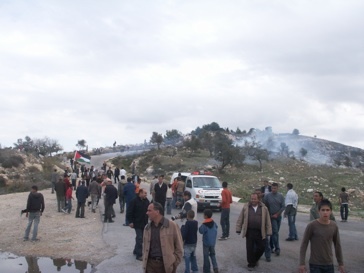 Demonstrators had aimed to get to the evacuated settlement to reclaim the lands upon which it stood – lands which legally belong to Palestinian villagers. 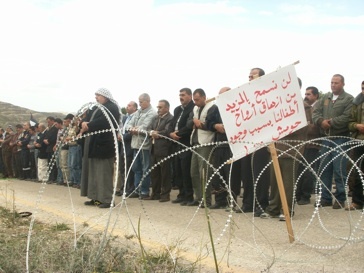 “These lands belong to private Palestinian land-owners”, said Burqa municipality member, Mohammad Masoud. “They [Palestinian villagers] have papers to prove that they own the land”. 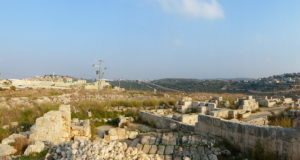 While the settlement was evacuated in August 2005, the lands have not yet been returned to the legal owners, under the flimsy pretext that the land is demarcated as Area C under the Oslo agreement. This goal of land reclamation is not just borne of the legitimate desire for vital lands to be returned to their legal owners, but also out of a real fear of the resettlement of the lands by ideological Israeli settlers. 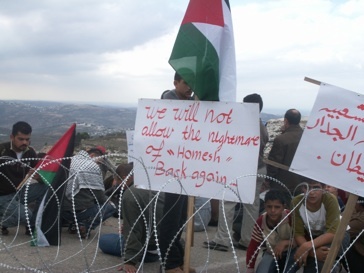 This fear is informed by the regular return of Israeli settlers to the evacuated lands – part of an ongoing campaign by the settler movement called “Homesh First” which demands the resettlement of Homesh. 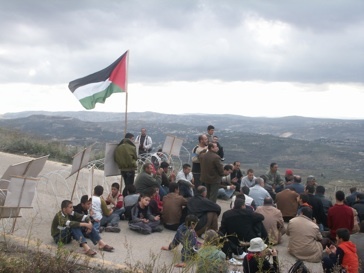 Burqa villagers claim that there are currently settlers occupying the lands, suggesting that this is part of the reason why their demonstrations are so forcefully prevented from accessing their lands by the Israeli authorities. 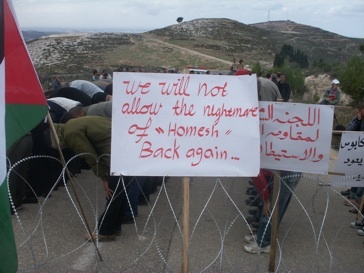 This spectre of the resettlement of Homesh is evidenced in placards carried by demonstrators: “We will not allow the nightmare of Homesh back again”. This “nightmare” refers to the regular attacks carried out by the settlers, who would especially target farmers and shepherds with lands adjacent to the settlement, beating farmers and killing livestock. These attacks have not abated since the evacuation of the settlement, with visiting Israelis continuing to attack farmers and shepherds, and burn olive trees. The very presence of the settlement in the area also leads to regular attacks on nearby villages by Israeli soldiers, especially in Burqa through which the main road to the settlement passes. Houses along this road are regularly invaded by Israeli soldiers, with those closest to the settlement having been forcibly evicted and destroyed by Israeli forces. Palestinian villagers have vowed to continue their struggle against the continuing nightmare of Homesh with weekly demonstrations.